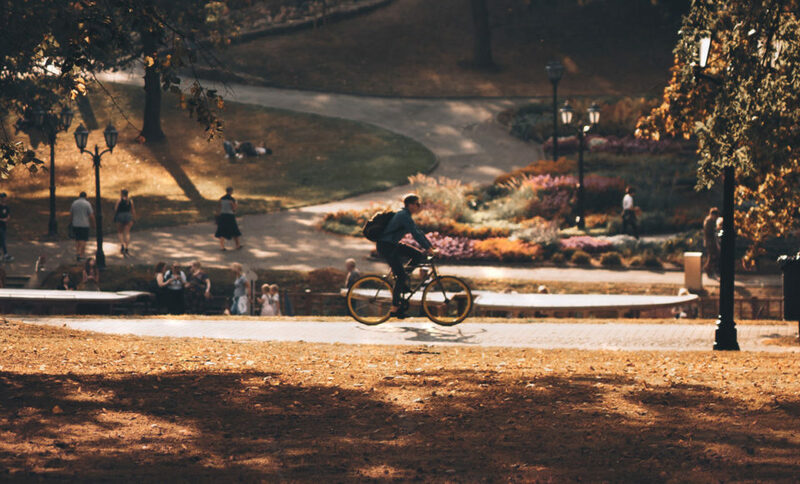 Even though the leaves are turning and temperatures are dropping, bicycles are still one of the best ways to get around. Using HOPR bike share is environmentally friendly, affordable, and one of the most time-efficient ways to combine a healthy lifestyle with your daily routine, such as commuting to work. But the changing of seasons can bring new challenges for those getting around by bike. We see less daylight hours, cooler mornings and evenings, and a lot more rain. But the new conditions need not be a deterrent, just another opportunity to find your footing on two wheels. Say goodbye to those hot sweaty commutes and discover how comfortable it is to ride a bike in cooler temperatures. Here are some tips for cycling in autumn to make sure you enjoy your commute through the season. Rain is one of the biggest obstacles for many when it comes to cycling during the fall. Good rain gear can keep you dry and warm and on your bike in even the most torrential of downpours. If you already own a rain jacket and rain pants you’re all set – no special gear is required. If you don’t, visit your local bike shop or outdoor retailer and they’ll carry the rain gear you need. While the HOPR bikes are equipped with fenders to prevent spray from the front wheel hitting your feet we can’t stop the rain from falling from the sky. Water resistant shoes will help keep your feet dry; we all know that having wet feet all day is no cakewalk. And if the weather is cold a pair of thick socks will keep you from getting tingly toes. While the asphalt or concrete should be ok there are a few hazards on the road that you’ll want to watch out for. Manhole covers, railroad tracks, or any form of metal becomes a lot more slick during a rainy day. Piles of leaves that become matted in wet weather and painted lines are also a slipping concern. Similarly, new rain brings up oil and gas left from cars. Overcoming these these hazards is easy, just slow down around corners and keep focused on the road ahead. If you don’t know how deep a puddle is don’t ride through it. While it might seem like a great idea the reflection of a puddle might be hiding a pothole that could send you over your handlebars. If you plan on riding in the rain it’s good know that the HOPR bikes use rim brakes – brakes that rub against the rim to stop you. If you have ever ridden in the rain with rim brakes maybe you’ve experienced a worrying moment where you can’t stop fast enough no matter how hard you squeeze. The best way to overcome this is by continually feathering the brakes on and off until you feel them begin to grip. By feathering the brakes you remove the water and dirt that keeps the brake pads from effectively gripping the rim. You’ll be surprised at how well this works! Layers allow you to be adaptable and ready to take on whatever the day brings. Being comfortable during your ride should be your priority or you won’t want to do it again. Look at the weather forecast and consider packing extra layers in your bag in case an unexpected chill moves in while you’re out and about. As daylight hours fade away and shorter days creep up on us it’s important to remain visible. HOPR bikes are equipped with lights on the front and rear of the bike. If wearing a bright yellow jacket isn’t your style there are plenty of great clothing options that have subtle reflective accents to help ensure you’re seen on the road. When you ride a bike your hands are completely exposed to the cool winds and rains that come with fall. This can leave your hands dry, numb, and painfully cold after a ride. Wearing gloves should not be an afterthought! If you’ve ever ridden in the cold without them you know that remembering to bring a pair will be one of the best decisions you make. While you ride it can be difficult to keep rain out of your eyes which is not only annoying but can obscure your vision. To help with this you might want to consider wearing a pair of glasses. If you don’t want to wear glasses or find the droplets distracting try wearing a helmet with a visor or a baseball hat.